The Rapidmix 400/600CW continuous mixing plant is well known for its ability to produce high quality roller compacted concrete (RCC), but less well known is it’s suitability for a wide range of environmental applications. Recently updated to incorporate full weighing options for all materials – aggregates, cement and water, the new generation Rapidmix 400 CW offers record keeping that is automated, precise and detailed. Fully mobile and self contained, the Rapidmix offers a complete plant powered by its own power source, with on-board compressor and generator. Fitted with a self erecting system, using hydraulics, the plant can change from travel mode to fully operational within a few hours. The Rapidmix 400 CW/600 CW mixes up to 400/600 Tonnes per hour depending on application and provides feed rates that are fully adjustable for the aggregate, cement and water systems. The process of removing and processing existing asphalt paving material during, for example, resurfacing or reconstruction, results in the production of ‘Reclaimed Asphalt Pavements’ or RAP. RAP, which comprises of valuable asphalt binder and aggregate, provides an opportunity in the face of dwindling supplies of virgin aggregates and asphalt binders. The reuse of asphalt pavements is one environmentally conscious way of ensuring the ongoing cycle of valuable natural resources. The correct use of RAP in asphalt paving mixes can provide both cost and energy savings and results in high quality pavement infrastructures with similar performance to that of pavements constructed with only virgin aggregates and binders. Aside from asphalt paving mixes, RAP can also be used as a subbase, stabilised base aggregate, and embankment/fill material. The Conti Group of New York utilised the Rapid Mix 400 to perform rehabilitation work on runways using RAP at JFK Airport, New York. 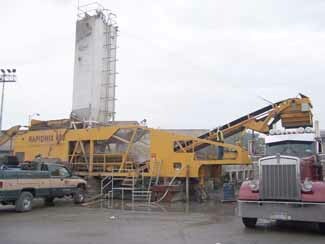 The process of rehabilitation involved milling asphalt recovered from the demolition of old runways, screening it, and then mixing it in the Rapid Mix 400 with cement and water. Between 70 and 80 percent of the material used was from the old runway thus providing huge economic benefits to the airport as well as being more environmentally friendly. Cement-treated base (Cement Treated Base) (CTB) is a strong, frost-resistant base for a concrete or asphalt pavement wearing surface. CTB is comprised of native soils, gravels/manufactured aggregates mixed with cement and water. 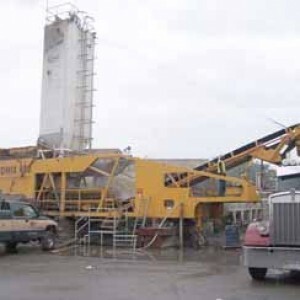 Woodruff and Sons, a general contractor located in the state of Florida, USA, used the Rapidmix capabilities to produce high quality CTB using recycled concrete on a variety of projects in Florida and Northern Indiana.